Allumer la console puis synchroniser la manette. Démarrer le jeu de votre choix. * La réduction du poinds est réalisée en enlevant les moteurs de vibration. 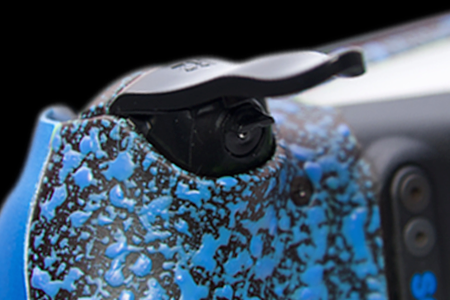 ** Les manettes SCUF sont approuvés en compétition, dont la MLG, ESL, UMG, Gfinity, EGL et ESWC. 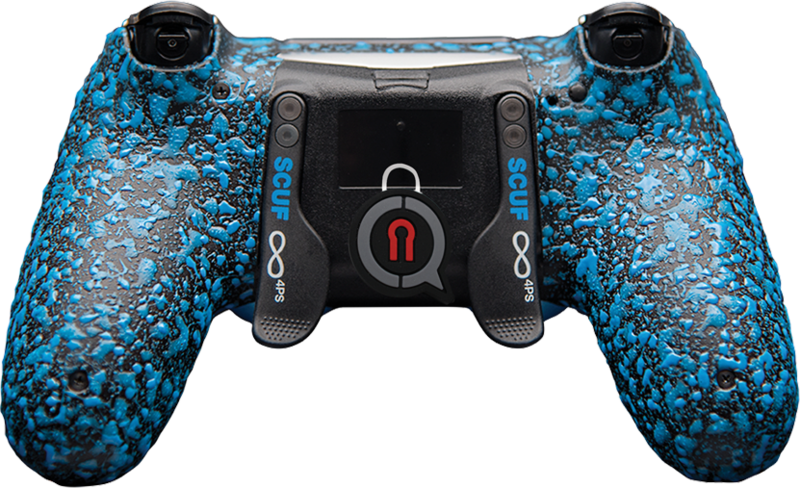 Step 1 Place the SCUF Infinity Lock over the Infinity Ring and Thumbstick on the controller. Line up the notches on the lock with the grooves on the ring. The notches on the bottom of the Infinity lock will insert into the grooves of the Infinity Ring. Step 2 When the lock and ring are lined up, turn the lock counter clockwise until movement stops. Pull straight up on the thumbstick to remove both the ring and the thumbstick at the same time. Step 3 Once the ring and thumbstick have been removed from the controller, replace with a new thumbstick of your choice. 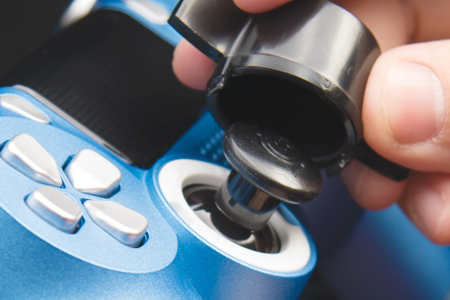 When placing a new thumbstick into your SCUF Infinity4PS, be sure to line up the thumbstick on the thumbstick shaft to ensure correct placement. 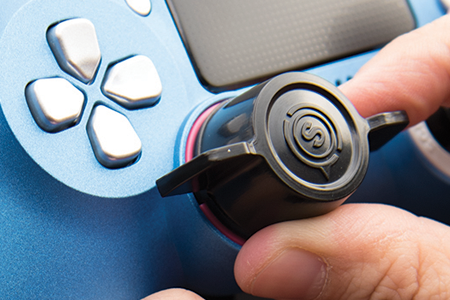 The thumbstick will lock into place on the controller. 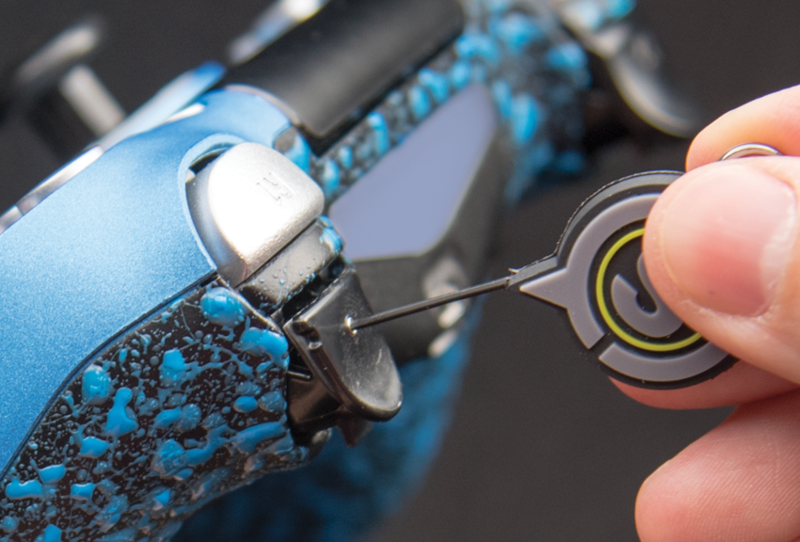 Step 4 Use your SCUF Infinity Lock to secure the ring in place by turning the lock clockwise until movement stops. 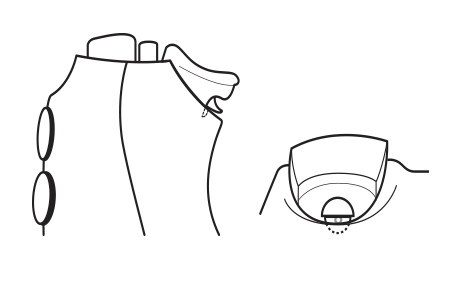 Step 1 To replace the trigger cover, use your opening tool (included) to apply pressure under the attached trigger cover and push up. Step 2 Once the cover has unclipped from the trigger, push down on the quick shift trigger stop and remove the cover. Step 3 To replace the trigger cover, push the trigger down on the quick shift trigger stops and snap the top part of the cover on. Tilt the cover down to snap on to the trigger. 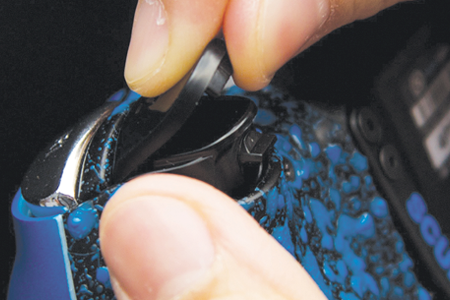 Step 1 Remove the short trigger cover or trigger extender to adjust the adjustable hair trigger mechanism. 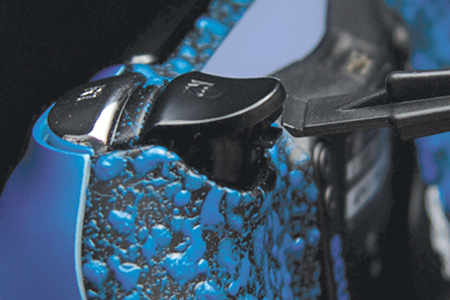 Step 3 With trigger stops off turn the 0.9mm SCUF key two full clockwise turns to tighten and activate the adjustable hair trigger. Note: It is recommended to adjust the hair triggers in game to adjust to preference. Tighten the adjustable hair trigger in game until the weapon fires, then loosen slightly to playing preference. 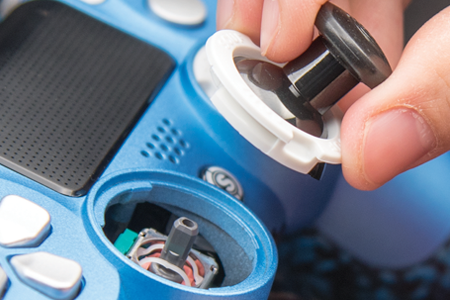 Step 4 To turn the adjustable hair trigger off, Insert the 0.9mm SCUF key into the adjustable screw on the top of the trigger mechanism and turn counterclockwise until the top of the screw is flush against the top of the trigger mechanism. 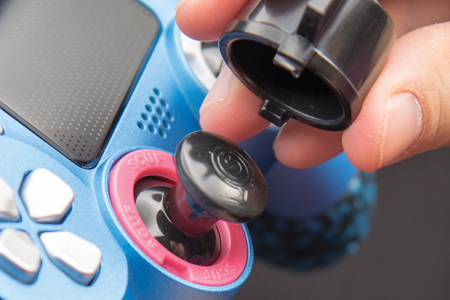 Step 2 Turn the 0.9mm SCUF Key 180° to either the left or right in order to turn on the Quick Shift Trigger Stop. 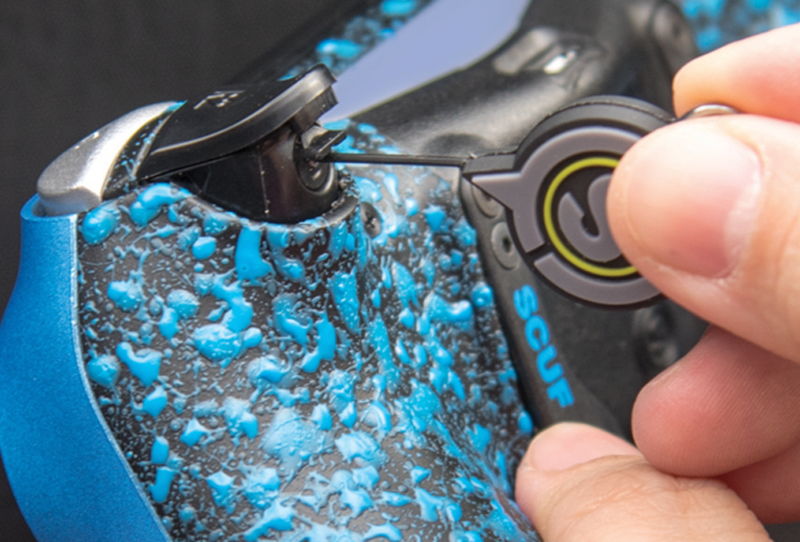 Step 3 To turn off the Quick Shift Trigger Stop, Insert the 0.9mm SCUF Key into the trigger mechanism and turn 180° to either the left or right. THIS IS AN OPTIONAL FEATURE AVAILABLE IF SELECTED AT TIME OF PURCHASE. Step 7 Remove the EMR Mag Key and place it at least 5cm away from the back of the controller to prevent the SCUF controller from accidentally entering remapping mode.